Death, that dark mother who claims her sons where and when as only she sees fit? Was it because he could not get insurance for pontine glioma, a pre-existing condition which is a description of illness that otherwise dehumanizes people? Was it because musical genius is plainly not to be ours for long on this mortal coil? Evil Chuck, as he came to be known, lived an altogether too brief life of 34 years and 7 months to the day. Born on the 13th. Died on the 13th. The dichotomous description of 13 as an unlucky number but also as a very Metal number need not be digressed into at this point. It is, after all, just a number. 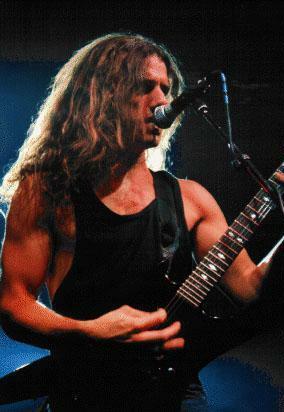 But Chuck Schuldiner was not merely just a man. He was a legend in music that went unheard by far too many ears. Reading interviews with Chuck, you could not help but feel his personality reach out and grab you. Listening to the mans records, you could not help but hear his personality reach out and consume you. Seeing the man in concert, you could not help but see his personality reach out and possess you. He was that kind of man. His music was that kind of music. His absence is that kind of absence. Evil Chuck is sorely missed by the Heavy Metal community, countless fans around the world, and certainly by his family. The daunting task of completing Chucks eternal wish to Let the Metal Flow -- his personal catch phrase -- now lays on the shoulders of Jane Schuldiner, his mother. Upon his passing, Chuck was midway through the recording of the second and unfortunately final Control Denied album. The rest of the musicians involved with the project are waiting in a sort of limbo based on legal issues that no mother, much less any music fan, wants to have to see. One of these days we can hope to hear Chucks final notes. This writer and fan anxiously waits for that day. The legacy that Schuldiner left behind is huge. He will always live on through his music, perhaps ironically so for a man who named his band Death. If you have never gotten into Death, why not do so now? I can remember the first time I heard each Death album. It was an experience then and remains so to this day. Symbolic and The Sound of Perseverance are easily my favorites, but the musicianship of Schuldiner and his rotating bandmates cannot be denied, particularly on 1991s Human and those that followed. The instrumental Voice of the Soul still brings tears to my eyes. It is magic. Information about Deaths members can be found in several places on the web, hence their omission here, but suffice it to say that many influential Metal madmen have spent time in Schuldiners camp and gone on to leave their own impact on Heavy Metal. More than one tribute to Evil Chuck is in the works, perhaps the most meaningful of these featuring James Murphy, the lead guitar master that has played not only with Death, but also with Cancer, Obituary, Testament, Konkhra, and his own Disincarnate, among others. The significance? James Murphy also has a rare form of cancer -- pituitary macro-adenoma -- but is recovering after the removal of tumors from behind his face. The end of an era was a new beginning. Owing to the magnificent sound put forth by Chuck Schuldiner, inspiration has once again spread throughout the Heavy Metal world. In the past few years in particular, perhaps commencing with Chucks death, Heavy Metal has made a virtual comeback. Yes, true Metal never left, but bands that were once relegated solely to the underground have received attention far greater than one might have ever imagined. Out of death, a rebirth.